How to apply for NVS Various Non Teaching posts 2019 recruitment, Apply Online: Navodaya vidyalaya Samiti has invited online applications to fill up 251 vacancies (tentative) of various Teaching, Non Teaching posts of Navodaya Vidyalaya cadre Detailed advertisement in this regard containing all details such as posts, number of vacancies, eligibility criteria. experience, age limit, relaxation of age, reservation & concession, examination Fee, opening & closing date of online registration of application etc are published in the Employment News dated 12th - 18th January, 2019. Detailed advertisement and also available on the website of the Samiti www.nvshq.org Eligible and interested candidates who wish to apply for these posts may refer the Employment News dated 12th - 18th January and Samiti website www.nvshq.org. 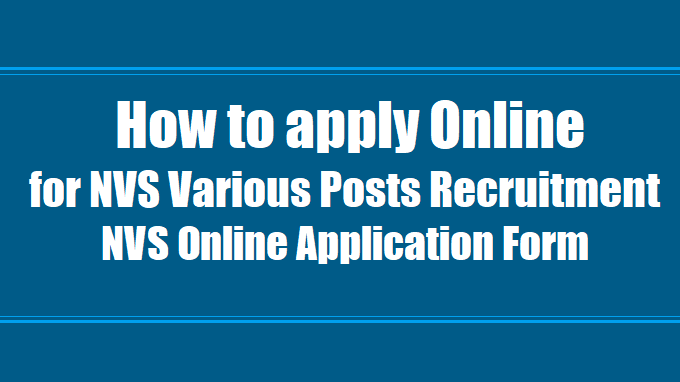 how to apply online for nvs various Teaching, Non teaching posts 2019 recruitment, nvs various non teaching posts online application form, how to fill online application form of nvs various non teaching posts 2019 recruitment. Recruitment to the Teaching, non-teaching posts in jawahar navodaya vidyalayas. Candidates in their own interest are advised not to wait till the last date and time to submit their application promptly and not to wait till the last date/time for applying online. NVS shall not be responsible if candidates are not able to submit their applications on account of the last minute rush. Please retain print-out of application form & payment acknowledgement slip (as applicable) for future references. Please do not send hard copy of the application form or any documents to the office of nvs. iv. The online applications should be filled carefully. Scan and upload your recent photograph, signature and thumb impression at the appropriate places as per instructions contained in the online application format and submit the same Online. Login Id and password would be generated on successful submission of application and will be displayed on the screen. Candidates are advised to note down their login Id and password for future use. v. No fee is required to be paid by candidates belonging to SC/ST/PH categories and Female candidates, hence, the steps for payment of fees will not be applicable to them in online application form. Once the fee is deposited the same shall not be refunded under any circumstances. Principal-Rs.1500/-, Assistant Commissioner (Administration)- Rs. 1500/-, PGTs- Rs.1000/-, Assistant-Rs.800/-& Computer Operator-Rs.800/-. vii. The candidates should take a printout of the online application and preserve for their record and should not send the same at the Navodaya Vidyalaya Samiti's address or any other address. The application printout will also have to be submitted during document verification at the time of interviews/document verification along with the attested copies of certificates in support of Age, Qualification. Experience, Caste, Non-Creamy Layer, Physical disability, as applicable. viii. The name of the candidate or his/her father/husband etc. should be spelt correctly in the application as it appears in the certificates/mark sheets. Any change/alteration found may disqualify the candidature. ix. Candidates are required to download the call letter from Navodaya Vidyalaya Samiti's website i.e. www.navodaya.gov.in and www.nvsrect2019.org Candidates may be intimated about the same through e-mail by the exam conducting agency of the Samiti. However, candidates are advised in their own interest to view Samiti's website from time to time with regard to the call letters and other updates about written examination and interviews, as they may not get the intimation through email due to technical fault. No correspondence would be entertained by the Samiti nor Samiti shall send separate intimation to the candidates to this effect. x. A candidate may apply for more than one post if he is eligible and desires to do so. In such cases, the candidate will have to pay the requisite fee for all the posts applied for. However, within PGT category, a candidate shall apply only in one subject. 2. The vacancies for the post of Audit Assistant, Hindi Translator, Stenographer, Catering Assistant, Staff Nurse, Lower Division Clerk/ Storekeeper, Lab Attendant indicated above are tentative and likely to be increased / decreased. The NVS reserves the right to fill or not to fill or partially fill any of the above positions without assigning any reasons whatsoever. NVS also reserves the right to cancel / restrict / modify / alter the recruitment process, if required, without issuing any further notice or assigning any reasons thereof. 4. No modifications are allowed after candidate submits the online application form. If any discrepancies are found between the data / information filled by the candidate in online application and the original testimonies, his / her candidature is liable to be rejected. website / designated recruitment portal only. 6. Response query management will be made operational on the designated recruitment portal after online Computer Based Test (CBT) is over for inviting comments/responses/objections, if any, from the candidates. Candidate has to pay the requisite fee for each challenge. Thereafter, objections will be referred to experts and key will be finalized by examination conducting agency for preparation of result. In case of successful challenge, the fee paid will be refunded to the candidate concerned. 7. Results of the online Computer Based Test (CBT) will be published on NVS website. No enquiry in this regard will be entertained by the NVS. The list of short listed candidates for recruitment to the post of Audit Assistant, Hindi Translator, Stenographer, Catering Assistant, Staff Nurse, Lower Division Clerk/ Storekeeper, Lab Attendant will also be displayed on the NVS website. No separate correspondence shall be entertained in this regard. 8. Canvassing in any form will disqualify a candidate. 10. The NVS may take up the verification of eligibility of the candidate at any point of time prior to or after the completion of the selection process and if it is found at any stage (including the date of joining & thereafter) that the candidate is not eligible, then his/ her candidature shall be summarily rejected. 11. All correspondence/announcements with respect to above recruitment process shall be done through e-mail/SMS/notices on the NVS website. Important information regarding recruitment will be available on NVS website and as such, candidates are advised to visit the same frequently. It is the responsibility of the candidate to download/print the Admit Card/Interview Letter/other information related to this recruitment displayed on the NVS website i.e. www.nvshq.org or designated portal. The NVS will not be responsible for any loss of email sent, due to invalid/wrong Email ID provided by the candidate or due to any other reason. Candidate’s E-mail Id and Mobile No. should be kept valid till the completion of recruitment process. 12. The NVS may, at its discretion, hold/cancel/re-examination as and when necessary in case if need arises for the same. In such eventuality, candidate will have to appear for such re-examination at his/her own cost. 13. No TA/DA will be paid to any candidate for appearing in the written examination or re- examination/ skill test etc. 14. Selected candidates are liable to be posted anywhere in India. However, 09 choices for posting in HQ/respective regional offices have been provided in the online application form for the post of Audit Assistant, Hindi Translator, Stenographer, LDC/Store Keeper. Candidates have to mandatorily opt for all the 09 choices in order of their preference. Similarly, in case of Staff Nurse, Catering Assistant and Lab Attendant 8 choices of Regional Office have been provided to opt for. But this does not confer any right to the candidates for their posting according to their preference and it will be the sole discretion of the NVS to decide the place of posting of the selected candidates. However, the allotment of region will be done taking into consideration the preferences of ROs opted and the performance of candidates in the final merit list. Regional Office once allotted will not be changed and the candidate has to submit an affidavit to serve in that region only. 15. LDC and LDC/Storekeeper are two distinct cadres. LDC posts are for HQ/Regional Offices only and LDC/Storekeeper posts are for JNVs under Regional Offices. Vacancies of LDC and LDC/Storekeeper have been notified in the present advertisement separately. Candidates may apply for LDC post only, for LDC/Storekeeper post only or for both posts. 16. Selected candidates will initially be on probation for a period two years, which can be extended at the discretion of the Competent Authority. During the probation period, services of probationer can be terminated at any time without assigning any reason thereof. 17. Qualifications acquired by the candidates should be strictly in accordance with the prescribed qualifications for respective post. Any candidate seeking claim of equivalence of the qualifications with that of the notified one should furnish documentary evidence in support of their claim at the time of verification of documents in the selection process, otherwise such case will be summarily rejected. Similarly, where grades have been given, the corresponding marks showing equivalent percentage of marks should be produced at the time of selection. 18. In case of any discrepancy or variation in the translated version of this advertisement is found in Hindi or any other language, the text provided in the English version will be treated as final. 19. The candidate response sheet and other related papers/documents of examination related to this recruitment would be kept as record for six months only from the date of examination. 20. Any dispute with regard to this recruitment shall be subject to the court having its jurisdiction in Delhi only. e) Obtaining support for his/her candidature by any means, such candidate in addition to rendering himself/herself liable to criminal prosecution. f) In case of possession and use of electronic devices such as Mobile Phone, Micro Phone or any other Associated Accessories, Calculator, Log Tables, pager, Digital Diary, Book/ Notes etc. during the On-line examination. g) Furnishing of false, tampered, fabricated particulars or suppress any material information while submitting the application or at any stage during the recruitment process. 2. For detailed Notification/Advertisement, click Recruitment for various posts ’and read it carefully before filling-up the on-line application. a. Valid E-mail ID & Mobile Number. Candidates should ensure that mobile number and email id should remain operational till the completion of entire recruitment process. c. Scanned copy of the recent passport size color Photograph (not older than 3 weeks). Candidates should ensure that the same photograph is used throughout this recruitment process. e. Matriculation Certificate as proof of Date of Birth (10th Passed Certificate). d. His/her educational qualifications as per eligibility criteria with percentage of marks obtained (please calculate percentage from CGPA Board’s conversion formula). g. Relevant certificates like Caste, Disability, Service certificate, etc., respectively for SC/ST/PWD/Ex-service Man Candidates seeking fee relaxation. 4. Category [General (UR)/SC/ST/OBC-NCL] once filled by candidate in the on-line application form will not be changed and no benefit of other category will be admissible. II. Re-login atleast after 24 hours on completion of Step II, submit fee online (as applicable) using either net banking/ credit card/ debit card. III. Candidates should take utmost care in furnishing/providing the correct details only while filling-up the on-line application. YOU CAN EDIT THE INFORMATION BEFORE SUBMISSION OF APPLICATION. Once the Form is submitted, it can’t be edited. Step-I: Sign-up by filling up Post Applied Name, Mobile No. and E-mail ID. The candidates will receive Application Sequence No. (User ID) & Password on their registered e-mail ID/registered Mobile. Step-III:Re-login after 24 hours on completion of Step II, submit fee online (as applicable) using either net banking/ credit card/ debit card. c. On completion of Step-I candidates will receive Application Sequence No (User ID) & Password on their registered email ID & mobile number. The size of the scanned image should be upto 100 KB in jpg/ jpeg format only. Size of file should be upto 100 KB in Jpg/jpeg format only. The size of file for certificates should be upto 1 MB in jpg/jpeg/PDF format only. a On completion of Step II, candidate needs to click on "Make Payment" tab active after minimum 24 hours. Once SB Collect of State Bank of India portal opens, then DO not click refresh or Back button. Select disclaimer check box and proceed. On next screen select Category ‘NVS RECTRUITMENT 2019’. System will redirect you on NVS page of State Bank Collect Portal. Enter required details i.e. application sequence number and date of birth (DD/MM/YY), then click on submit button. Kindly check and confirm the details shown on the next screen i.e. application sequence number, DOB, Name, Mobile Number, Email-id, Post Applied, Category etc., then click on submit button. Select the On-line payment option i.e. Internet Banking/ Credit Card / Debit Card. Kindly make the online payment via credit or debit card or Internet Banking and retained the transaction number for future reference. c. Candidates are advised not to attempt for registration more than once for one post. In case of multiple registrations for one post is attempted, only the last application will be considered. d. Technical queries/ clarifications relating to the filling up of ONLINE APPLICATION, please feel free to contact the helpdesk at Email: nvshelpdesk.2019@gmail.com Or Phone No . :18002663103 from 9 AM to 6 PM.